For longer use cases, with an emphasis on residential comforts, containers can be modified to include porches, skylights, awnings, sliding doors—pretty much anything you could find in a permanent residence. 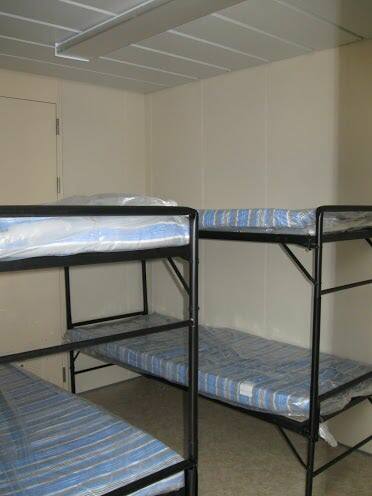 Space is usually limited in a situation where temporary housing is needed, as is budget. As a result, efficiency is of the utmost importance. In terms of space, shipping container structures are quite efficient: a 40-foot container can hold up to 8 individuals. Thanks to their small size and quality insulation (after modification), the containers can also be made efficient in terms of energy consumption. Shipping container structures aren't just efficient on their own. They can be easily linked to one another by placing them side-by-side or by stacking. This increases the efficiency in terms of space, and can create multi-room homes or a more community-centered setting, as desired. By nature, temporary homes are designed to be inhabited for a limited period of time and then moved to where they are needed next. Additionally, speedy set-up is essential in disaster relief situations. Therefore, the ease of portability is one of the most important features in a temporary shipping container home. Shipping container homes can be easily set up and broken down, as well as transported using normal shipping channels.